I grew up hearing my mother's "Miracle of Youth" Holocaust survival story. I only learned the details of my father's life after his death. I never knew either of my grandfathers, but am fortunate to have spent time as a young child with my extraordinarily strong grandmothers, have a remarkable family of intelligent survivors, and am close to my cousins. My father, Andrew Kovary-Andrews, was born into an Orthodox Jewish family in Galanta. He was the fifth of 10 children born to Rose and Alexander Kovary. Three of the ten children were killed in the Holocaust, one died as a child of a bee sting. Most of the others either were lucky enough to survive the Holocaust in concentration camps or were in hiding. Andrew escaped Galanta before the Nazis took over; gambling his way through the south of France and settled in England. He Anglicized his name from Andor Kovary to “Andrew Andrews” and joined the British Army during WWII, serving as a pharmacist to Winston Churchill. After the war, Andrew was able to bring some of his surviving siblings, their spouses, and his mother to live with him in England. In the 1950’s, most of the surviving Kovary family immigrated by ship to either Canada or New York. My mother, Eva Grunstein, grew up in a Neolog (Reform) Jewish family in Nove Zamky. She was the younger of two daughters of Franciska and Jeno (“Eugene”) Grunstein. She and her sister Kato (“Kathy”) attended Jewish elementary school, and when that was no longer possible, were enrolled in a Catholic high school. Their parents owned a housewares store in town and gave them a wonderful childhood – with music lessons, sports and language classes. Jewish elementary school, Nove Zamky, Slovakia, c. 1933. Kathy 2nd row 5th from left. Eva 2nd row 4th from right. In 1942, at the age of 18, Eva traveled to nearby Budapest, Hungary to study photography. There she befriended a young man, Hanzi Beiro, who was half Jewish and worked with the underground resistance movement. Hanzi was able to procure another woman’s original identification papers for Eva; henceforth, her new identity was to become “Anna-Aranka Papay.” A Catholic woman 7 years older than Eva. After leaving a fake suicide note, her coat with its tell-tale yellow star, and purse with her true identification on the banks of the Danube River in 1943, my mother now a fugitive — her brunette hair now dyed blond, and with her new identity as as “Miss Papay,” — found work as a governess for the well-to-do Bognar family in the small rural Hungarian town of Orgovany. 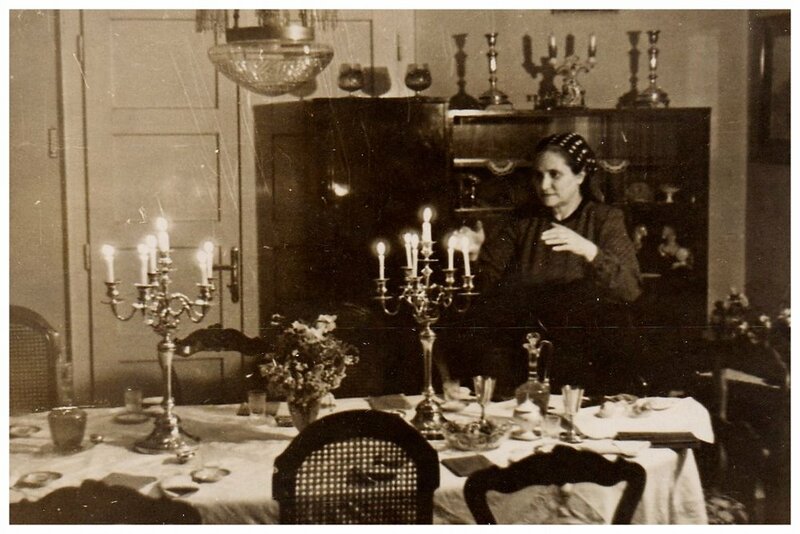 Her knowledge of languages, piano, and sports, an asset not many Hungarian non-Jews had back then, endeared her to the family and especially the children, 6 year old son Ildiko and 4 year old daughter Jancsika, in her care. Early in 1945, as the Soviet Army began the liberation of Hungary from the Nazis, and the end of the war approached, Eva made her way back to Budapest, and from there, to Yugoslavia. En route, she was rounded up with other “suspicious characters” and questioned by the Germans. The Nazi soldiers didn’t believe her papers were authentic …which made her literally laugh out loud as “Miss Papay’s” papers were authentic; it was she who was not. Not realizing that my mother understood German, the soldiers discussed that she could not be Jewish: she looked healthy, was blond, and didn’t seem scared. Eva miraculously was released, while others who had been captured in the same “round up” were killed on the spot. She reunited with Hanzi; and with others they cobbled together a sled from the rubble of the war and walked their way towards free Yugoslavia. 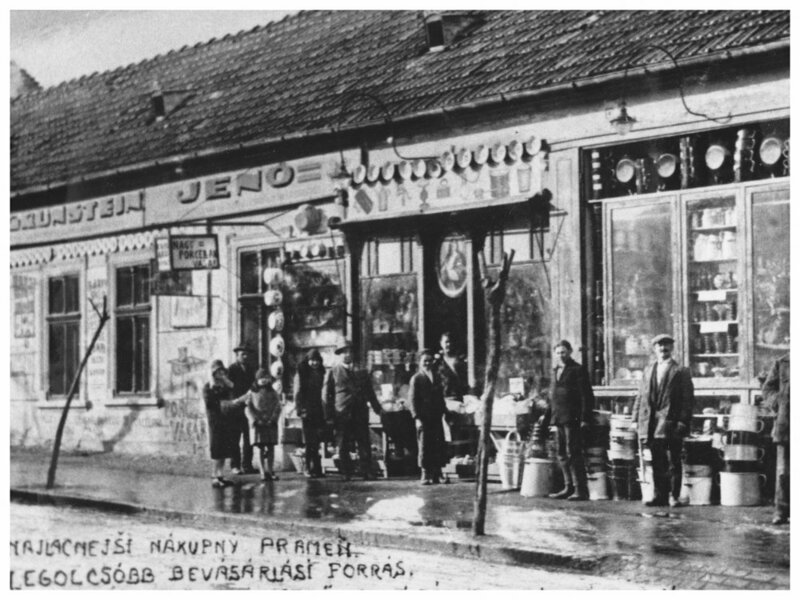 Engagement party, Nove Zamky, Slovakia c.1941. Standing: Ignac Grunstein, Jeno Grunstein, Hermina Sonenschein, Morris Sonnenschein. Seated: Martin Weiss, Katarina Grunstein, Lipot Weiss, Franciska Grunstein. Kathy Bielik's accordion - buried underground during war years. Kathy was a music teacher, specializing in the accordion, and Martin was a watchmaker. In 1942, Martin was taken to a work camp in Hungary, and in 1943 was sent to the Mauthausen concentration camp. When the Jews of Nove Zamky were being rounded up and put in a ghetto, Kathy decided to hide and bury her treasured accordion in her backyard garden for safe keeping. Miraculously, it remained there untouched until the end of the war. 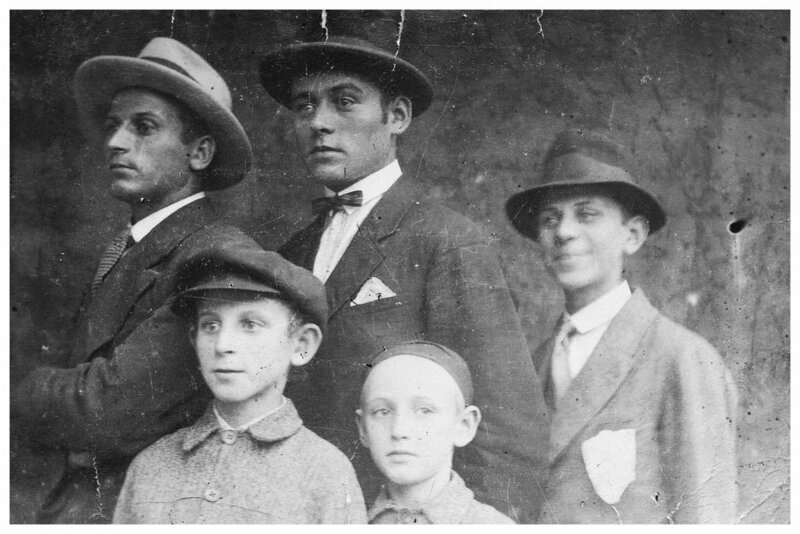 In early 1944, my grandfather Jeno, his brother Ignac, brother-in-law Morris, nephew Feri, along with other male relatives and Jews from their town were transported to the Auschwitz concentration camp in Poland where they were murdered. In the fall of 1944, Kathy, her mother Franciska and aunt Hermina were also sent to Auschwitz. A devoted daughter, Kathy held her mother and aunt close when facing the selection process of the infamous Nazi Dr. Mengele: one line of people sent to labor in the camp, the other line to the gas chamber. Kathy Bielik displays her Auschwitz identification tattoo as part of her Shoah Foundation testimony. 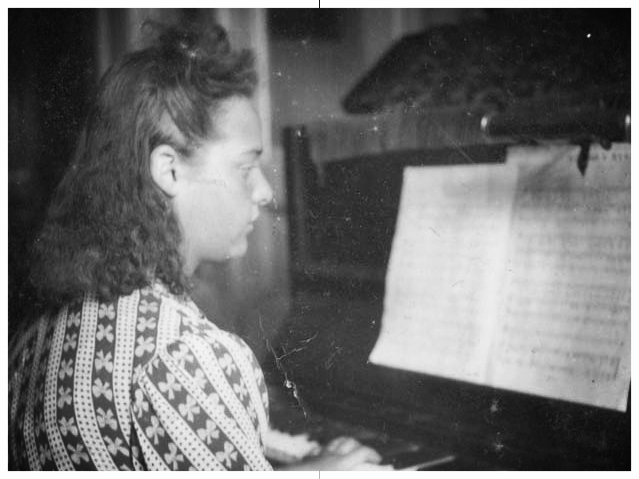 Due to her musical talent, for a short period Kathy was selected to be part of the Auschwitz orchestra – playing as the prisoners marched to and from work. Later, she was sent to work in a munitions factory, AEG - Trautenau, making airplane parts. Here Kathy's knack for languages helped her befriend its German civilian foreman. This foreman regularly hid an extra piece of bread under Kathy's workstation – this small, extra ration, which she shared with her mother and aunt, helped keep them alive when others were dying of starvation. After liberation Kathy kept in touch with the foreman and declared him a “Righteous Gentile” among the Righteous of the Nations with Yad Vashem – The World Holocaust Remembrance Center in Jerusalem, Israel. Surviving to end of the war, in mid-1945, Kathy, her mother, and aunt slowly made their way back to their bombed out hometown of Nove Zamky. Martin miraculously appeared at the door about a month later, suffering of typhus. My mother, Eva, lived out the remaining months of the war in Yugoslavia and reunited with her mother, sister and aunt late in 1945. Eva was not interested in remaining in her home town and returned to Yugoslavia. Soon, she made her way to a DP (“Displaced Persons”) camp in Italy along with many thousands of Jews and others uprooted by the war. 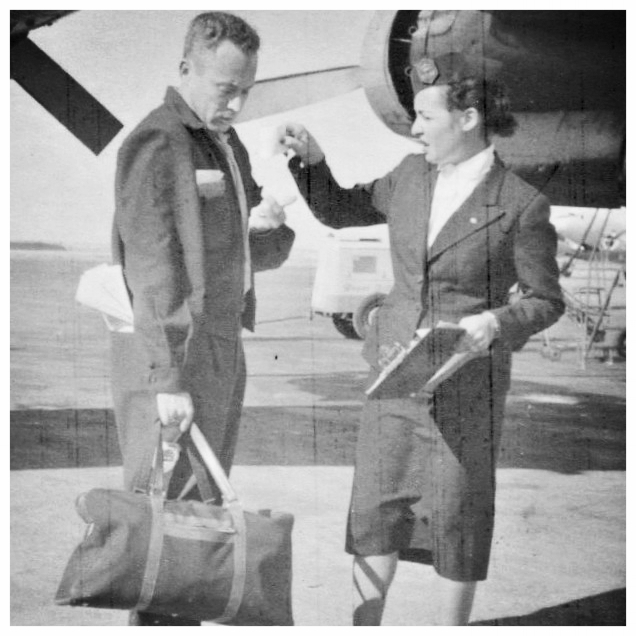 In 1950, Eva traveled by ship to Israel. While living and working in Israel she met the author Leon Uris who was then working on researching a book on the birth of the nation of Israel. Eva accompanied and assisted him. Her life story became part of his research, and Uris eventually based the backstory of some of the characters in his novel “Exodus” on her. In 1957, Eva’s employer, KLM Airlines transferred her to New York City. Ivan and Livia, from Slovakia to live with us in Queens, New York. Eva, Andrew, Kathy, Martin, and their parents are gone now, but their struggles and survival through the Holocaust, and what my mother termed her “Miracle of Youth”, made it possible for my husband and I to now live in our beautiful Vermont and for our children, my cousins, their children, and grandchildren to live happy, free lives throughout the United States and Israel. !עם ישראל חי Am Yisrael Chai! The People of Israel live!